The 1900's, from 1900 to 1909, was a period of continued growth for the sugar plantation owned by Claus Spreckels, with its agent Irwin and Company. 27% of the camp dwellings were built in this period. Spreckels, however, was no longer interested in conducting business in Hawaii. This lack of interest plus the interest by Irwin and Company in reducing its business responsibilities created the environment for C. Brewer and Company to expand its sugar holdings. Major building blocks were established to enable Hawaii businesses to control sugar interests and profits in Hawaii. 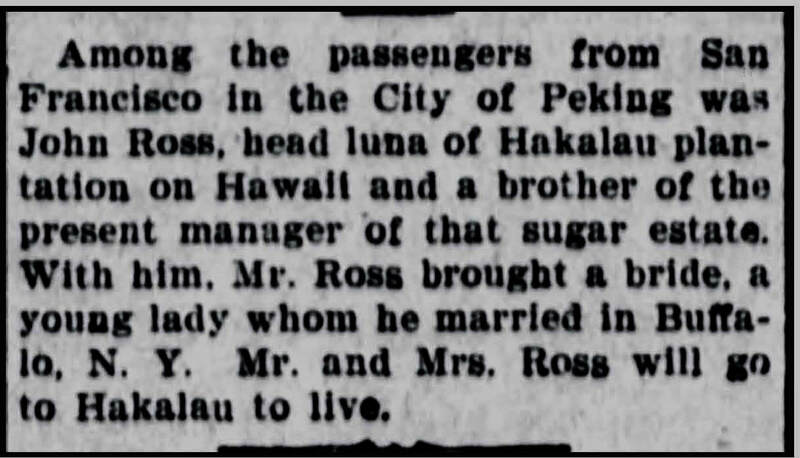 John M. Ross, Head Overseer for the Hakalau Plantation returned to Hakalau after marrying Georgiana Stewart in Buffalo, New York. Evening Bulletin (Honolulu, Hawaii), Jan 5, 1903, Page 1, accessed via Newspapers.com. Photo taken between 1903 and 1905. Front row left: Katherine Ross, wife of plantation manager George Ross; right: Georgiana Ross, wife of John M. Ross, head overseer and brother of George Ross. Photo provided by Billy Spiedel. Hawaii sugar planters succeeded in establishing their own co-operative refinery at Crockett, California, now known and C and H Sugar. The Hakalau Plantation provided one-acre land with no rent or time limit for the Hakalau Jodo Mission. George Ross provides a monthly stipend from the Hakalau Plantation to the Hakalau Jodo Mission in Hakalau Upper Camp in July 1905. This coincides with the arrival of Minister Soma's wife from Japan. John M. Ross becomes Hakalau Plantation Manager, replacing his brother George. One day in 1909 Irwin was having lunch at the Honolulu Pacific Club with George R. Carter of C. Brewer and Company, the oldest sugar agency in the islands. Irwin said that he would like to be relieved of some of the burdens of business. Carter then suggested a merger of the two companies. Irwin answered: "I like the idea and am ready to talk about it." He soon left for San Francisco, and was followed by E. Faxon Bishop, a director of the Brewer Company. They quietly worked out details of the change on the Coast. There were sound economic and other reasons for the merger. As already shown, the fortunes of the Irwin company were on the decline. Spreckels' interest in Hawaii had waned well before the end of the nineteenth century. Irwin was getting along in years--he was about sixty-five at the time of the merger--and had no son to succeed him. Absentee management from San Francisco was proving burdensome. W.M. Giffard, acting manager while Irwin was away, was also ready to retire. Brewer and Company doubtless thought it could breathe new life into the interests represented by Irwin and Company, and that the merger would yield economies of large-scale operation. Many of the plantations represented by the Irwin company adjoined those of Brewer and the merger doubled the amount of sugar marketed by Brewer, and gave that firm another outlet for it's retained earnings in the form of investment in plantations previously controlled by Irwin.